Launceston boss Cliff Ranford has criticised his side for their performance at relegation-threatened Southend, after their 20-17 defeat. 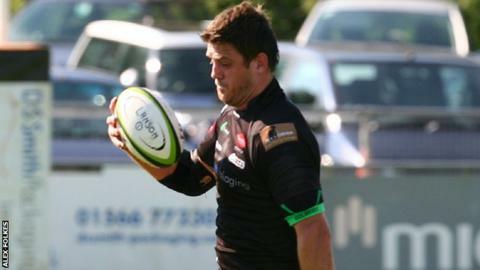 The Cornish All Blacks had won eight of their last nine fixtures going into the game including last week. "I don't think we turned up to be honest," Rainford BBC Radio Cornwall. "We should have come here with our 'A' game but we let them in, let them play their game and didn't dominate." Tries from Mark Billings and Daniel Legge put Southend 10-3 up at half time. Andrew Frost's penalty increased the lead before Launceston got a penalty try. Sam Arnott scored for Southend to make it 20-10 with 10 minutes to go before Ben Hilton's injury time penalty set up a nervous end for the home side. "We didn't give them the respect they deserved," Rainford continued. "You string a few wins together and the more you string together the harder it becomes to maintain it. "I think if you're going to have a wobble it tends to be against the sides lower down the league."